This post ?Oil Shock!? appeared first on Daily Reckoning. Is the economy in for a jolting ?oil shock?? Today we wander out to the tail end of the bell curve? look around for black swans? and raise scandalous questions. ?Judging by internet searches for the term,? says Bloomberg commodities analyst David Fickling, ?an oil shock is the last thing anyone should be worried about.? We would be ?shocked? if the search term ?oil shock? drew any attention at all these past few years. It has been rebuilding steam for the past two years ? but quietly. Oil has since taken a long, meandering route to last month's $72… before retracing a few steps. But hardly suggesting oil ?shock.? That is, they needn't return to 2014's $115 to constitute a shock? or even $100. Before last November, oil had not cracked the $60 mark since June 2015 ? precisely three years ago. Today's $65?72 range thus exceeds the peak price over the past three years. By this narrow definition? we are witnessing an oil shock. To illustrate, take some liberty and extend the analysis a year or two? But that spike, Fickling concludes, was sufficient to trigger the recession of the early '90s ? at least in part. Do not focus on the dollar price we are asked to conclude? but the current price compared with recent peaks. Incidentally? many analysts project the highest gas prices in four years this summer. Unemployment is at multidecade lows? tax cuts are fattening the national purse? markets are regaining their bounce after February's correction. Bank of America Merrill Lynch is typical when it says it doesn't expect higher oil to produce ?a material slowdown in growth.? These results demonstrated that the professional wiseacres missed 148 out of 153 world recessions ? a nearly imperfect record. And let the record show? Moreover, they approach on cat's paws? and pounce without warning. 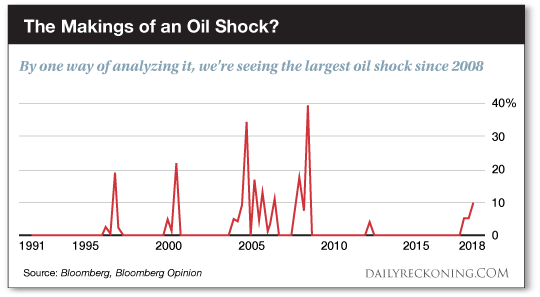 Oil shocks are prophets ? not partners ? of economic downturns. This means that one shouldn't expect to see other signs of weakness until the shock has already taken root. 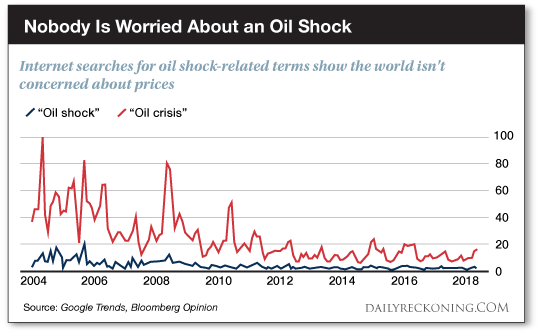 So unless supplies surge and prices ease sharply, and in the very near future to offset what has already been a remarkable "oil shock," the next downturn may already be a foregone conclusion. But few are taking any note of an oil shock right now ? which we find worrying. The post ?Oil Shock!? appeared first on Daily Reckoning.